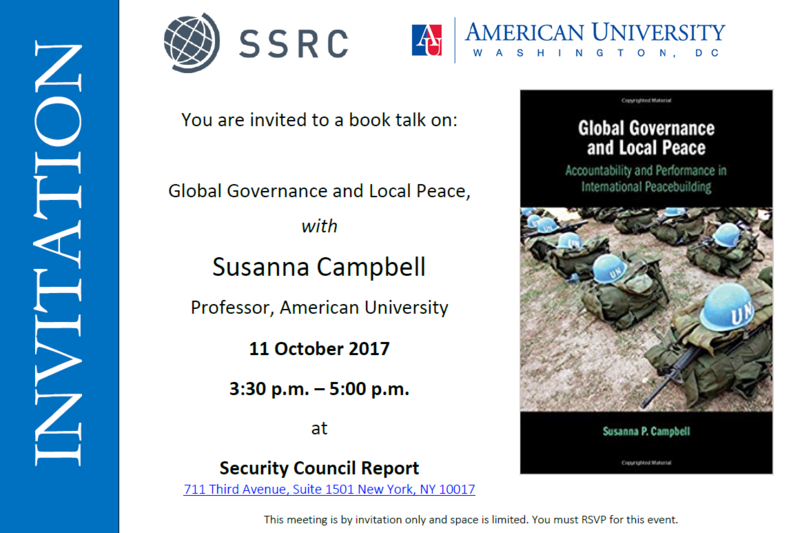 On 11 October 2018, the Understanding Violent Conflict (UVC) program hosted a talk with Professor Susanna Campbell on her new book Global Governance and Local Peace: Accountability and Performance in International Peacebuilding. The talk was moderated by UVC Program Director Dr. Tatiana Carayannis and held at the Security Council Report in New York. SSRC staff and guests of the UVC from neighboring institutions working on issues of global governance and peacebuilding were also in attendance. 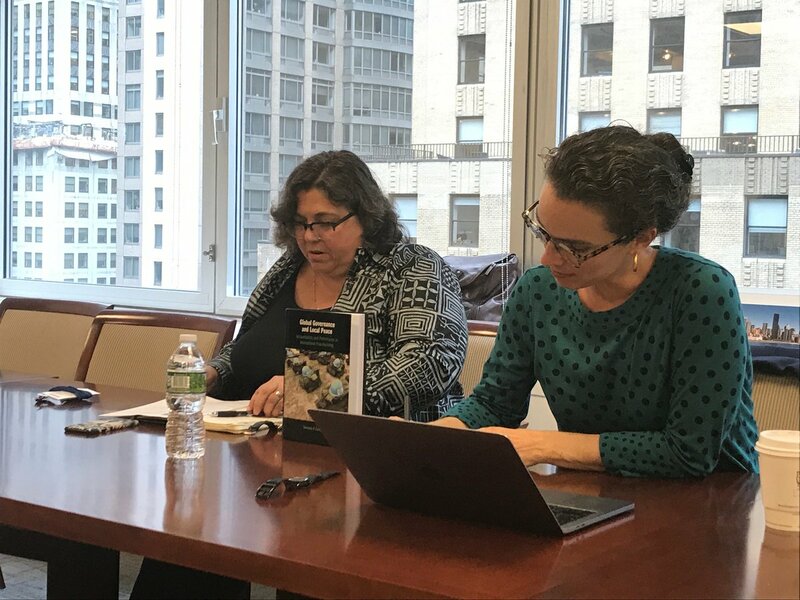 Professor Campbell’s new book presents the research findings of her fifteen-year study of five different peacebuilding organizations operating to transform state-society relations across several countries, including Burundi. The book argues for a need for change in the global governance and accountability structures of international peacebuilding organizations that are primarily accountable to donors and focused on building consensus at the country level despite the fact that the success of any intervention in transforming the societal framework depends on feedback from and accountable to local stakeholders in the host country. Dr. Campbell found that peacebuilding missions functioning amidst this tension were most successful when bureaucrats broke the rules of accountability. It is when rule-breaking bureaucrats engage with local accountability routines, build the right relationships, and systematically harness and apply local feedback to processes of project execution, implementation, and reporting that international aid organizations can reduce the gap between their aims and outcomes. In highly bureaucratic organizational structures, effectiveness relies on staff that can be innovative and learn from the country and local context. By making peacebuilding organizations more accountable to local stakeholders in the host country, bad behavior fuels good performance. After her talk, attendees were able to cross-examine Dr. Campbell’s research findings and asked questions that opened the floor for a fruitful discussion about the possible future of international peacebuilding organizations. Professor Campbell is an Assistant Professor at the School of International Service at American University in Washington, D.C. Her work focuses on war-to-peace peacebuilding, peacekeeping missions, international development, and other areas focused on international development in conflict areas.